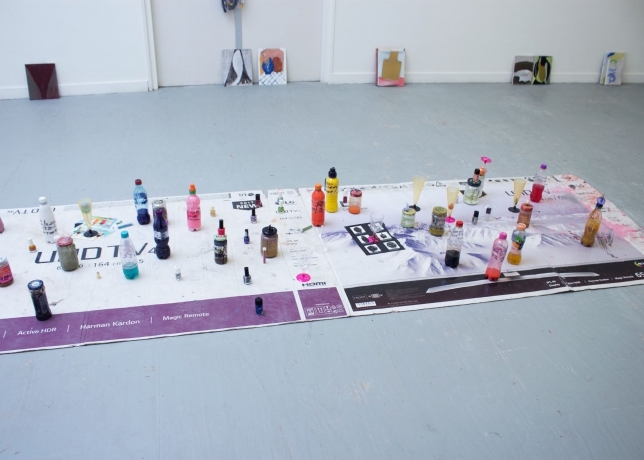 Floorpiece: pigment pastes, nail polishes, oil paint mediums, plastic wine glasses, bubble tea / dessert menu card, various toys, glitters,eye-moisturizer, images from archive and a LG ULTRA HD 4K 65 inch TV box. Paintings: oil, acrylic, nail polish, glitters and spray-paint on cotton or fabrics. Variable sizes: max 25 x 30 cm, min 18 X 24 cm.